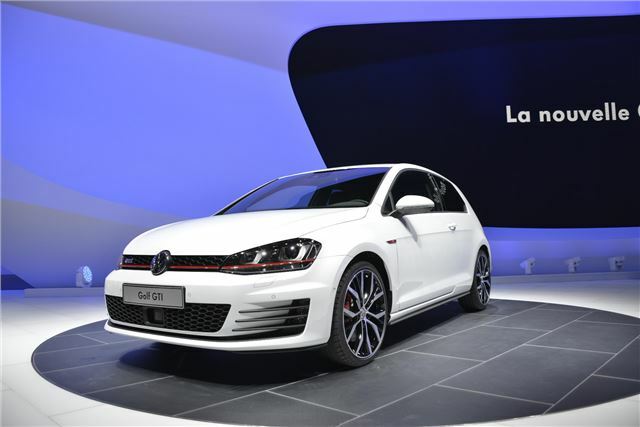 Previewed last autumn as a 'concept', the near-identical production Volkswagen Golf GTI breaks cover at Geneva - and looks set to become 2013's favourite hot hatchback. The standard 220PS version is joined by a 230PS Performance Package version - both are powered by a 2.0-litre TSI - but the latter gets uprated brakes and a front differential. The GTI receives the usual low-key exterior - lowered suspension, twin exhausts, 18-inch alloy wheels and a body kit with complementary red pinstriping. A six-speed manual transmission is standard in both cars, with a six-speed DSG available as an option. Performance figures aren't class-leading, but they never really were for the Golf - 0-62mph in 6.5 seconds and reach a 153mph maximum speed. Fuel consumption is 47.1mpg combined, and CO2 emissions are 139g/km. More interestingly - and potentially a much larger seller in the UK - is the new GTD model. Visually identical to the GTI, it's not much slower either thanks to its 181bhp 2.0 TDI power unit. CO2 emissions are 109g/km, combined consumption is 67.3mpg, yet its 0-62mph time is 7.5 seconds, and its maximum speed is 137mph. Prices for the new VW Golf GTI are expected to start at £27,500, rising to over £30,000 for the five-door with options and DSG.